Happy Holidays from Da Vinci Design! DVD, thank you for a wonderful semester. You have made the transition into our new home seamless and so very successful! All students finished strong with POLs, and we want to give a special congratulations to all of our freshman on completing their first POLs. Have a great break, and we look forward to seeing you back at DVD on Tuesday, Jan 16th. Investing in a Da Vinci Education – Make a Year-End, Tax-Deductible Gift Today! Each year Da Vinci Schools rely on gifts to the Annual Giving Campaign to meet the immediate needs of our schools and programs. These gifts play a tremendous role in our ability to provide a real-world, college and career-ready education. All gifts and pledges will be matched through April 30, 2018, up to $75,000. All gifts $1-$365 will support the entire K-14 community. Contribution amounts over $365 may be directed to the school or program of your choice. We ask families and friends to consider a minimum gift of $365 per year (only $1 per day). We will also not be marking students tardy until 8:30. We will remedy this next semester, but in the short term very much appreciate your patience and support these last few days! Designers, in our last week of semester 1, POLs and their corresponding schedule continue Monday through Thursday. Friday will be a minimum day, running from 9-1:30. Winter Break runs from December 23-January 15. The first day of semester 2 is Tuesday, January 16th. Report cards will be mailed out on Saturday, December 23. Please allow 2-3 business days for those to arrive at your home. Have a wonderful holiday and winter break! Da Vinci is once again offering an ACT/SAT Prep course to its students through PJ Test Prep, a small Test Prep and Tutoring company based in the south bay. They have been in business since 2005 and have been offering SAT/ACT prep with Da Vinci for 3 years and they do a great job! The course, open to all students from all DV high schools, will be 5 days over winter break from Monday, January 8th to Friday, January 12th, 2.5 hours per day. Students can sign up for either the AM session (10:00-12:30) or the PM session (1:15-3:45) and are expected to attend the same session for all 5 days. The course costs only $50 per student. Partial scholarships are available, so please don’t let the cost stop you from signing up! After signing up here, students must pay the $50 course fee to their school’s office. Please make checks out to “Da Vinci Schools” and write “Test Prep” on the memo line. POLs are upon us and we are very excited to see the students give presentations and show their growth and mastery from fall semester. Please be advised that if you plan on coming to campus watch your student’s presentation, you must check in at the front office on the bottom floor and receive a visitors pass. If you come to DVD’s floor without a visitors pass, you will be directed back to the bottom floor to obtain one. 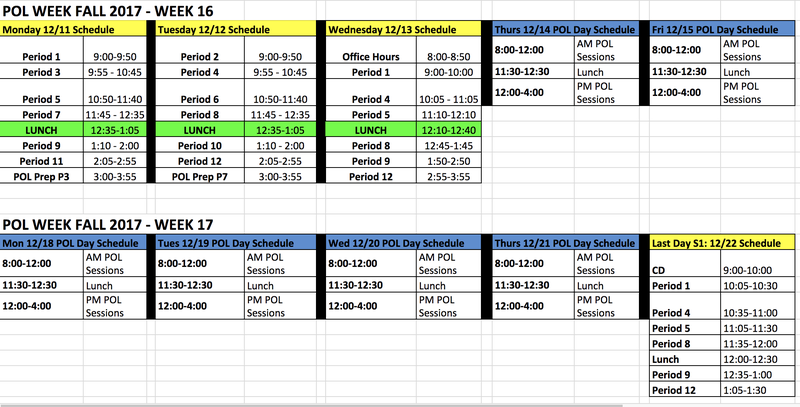 POLs run from 12/14 through 12/21. 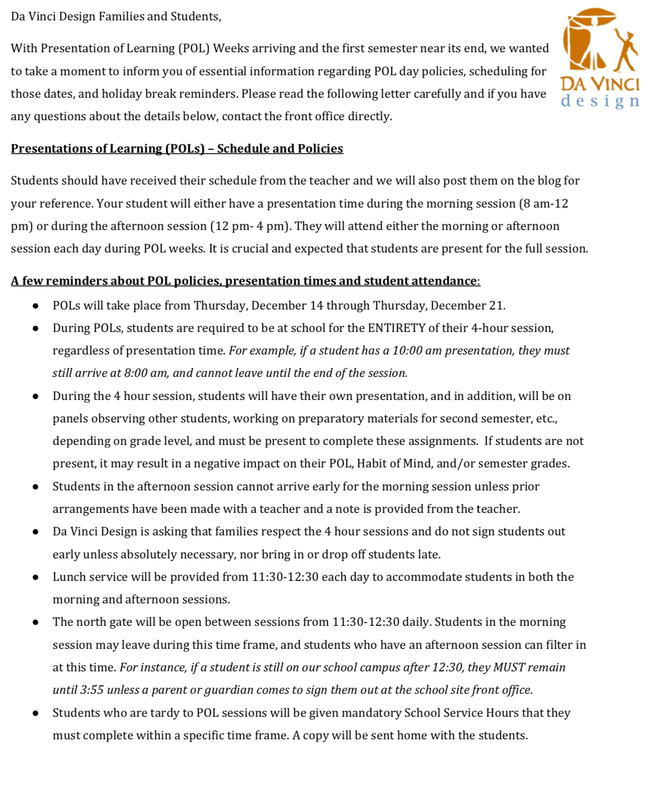 Students are either in the morning (8:00-12:00) or afternoon (12:00-4:00) session and lunch is served between 11:30-12:30 so that students from both sessions have the opportunity to purchase lunch/ Below is the POL letter that was shared last week, with more detailed information regarding the POL days. Friday 12/22 is a minimum day that runs from 9:00-1:30. 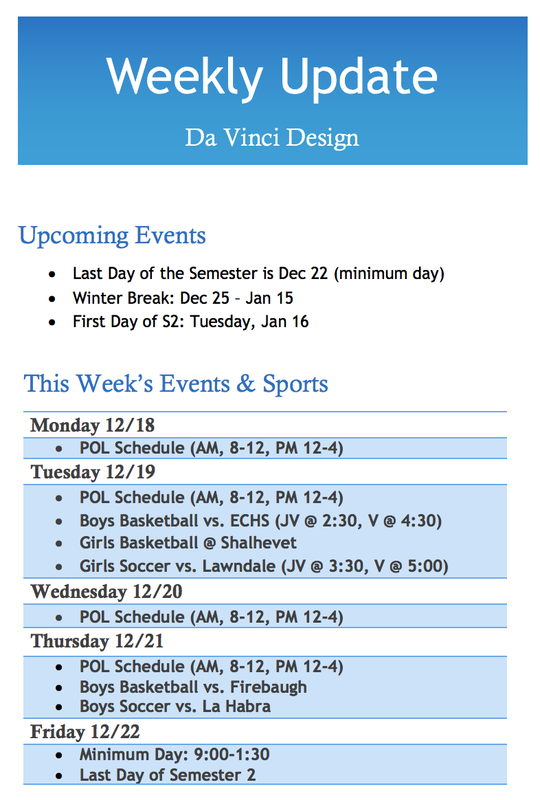 Designers, we hope you had a great week and are gearing up for POLs, which start on Thursday 12/14! If you have yet to see the new building, please join us at the Grand Opening Ceremony tomorrow, Saturday 12/9. There is a ceremony from 10:00-11:00 and an open house from 11:00-1:00. Senior families, if you missed first the FAFSA & Dream Act Night, there is a another opportunity to attend. It will take place Monday, December 11th at 5:00 p.m. at DVD on the 4th floor in room 4107. 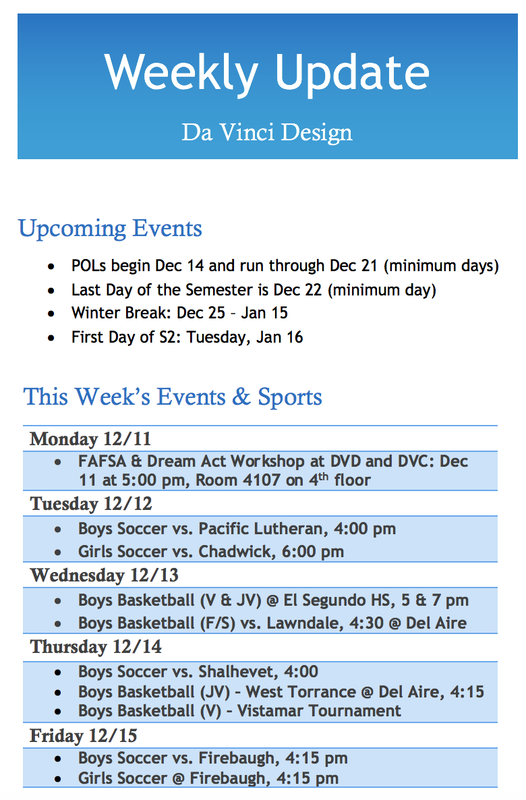 Da Vinci is offering ACT/SAT Prep courses over Winter Break. If you are interested please check out this previous post with information. Designers, families and community members, if you haven’t already had a chance to check out the new building, join us this Saturday 12/9 for the Grand Opening Celebration. The more formal ceremony starts at 10:00 am, followed by an Open House from 11:00 am-1:00 pm. 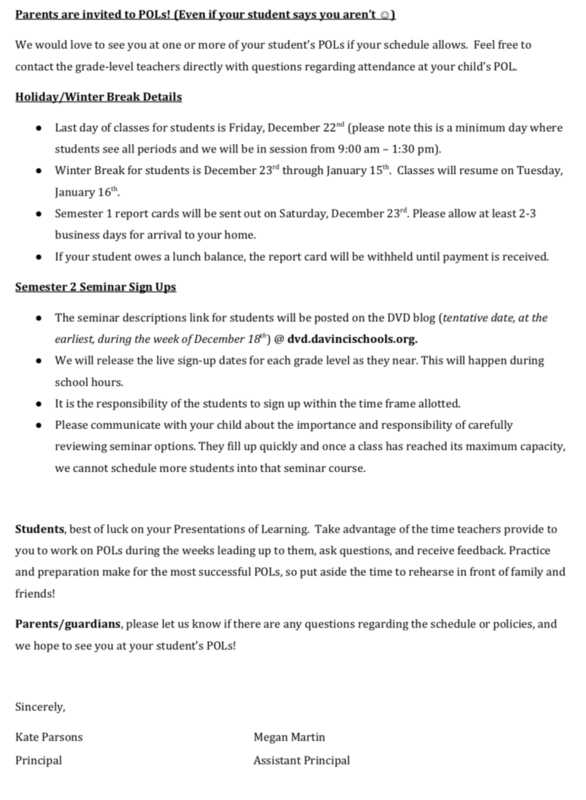 Design families, please see the letter below regarding POL information, reminders, and expectations. We will also give out a copy to each student in advisory later this week for them to bring home. Thank you! Today we had an unplanned evacuation of our building today at 9:55 am. The cause was determined to be smoke from a lab that was taking place in a chemistry classroom. Everything was found to be normal and safe for students to return, and the students returned to class at 10:15. We are proud of our students for handling this event efficiently and safely!